Oh how I have missed…. – Helen, Naturally! Oh how I have missed…. You know how I have been MIA on the blog lately? Yeah, and I have mentioned that I have also been a little MIA on healthy food as well as exercise. I am slowly but surely trying to get back on track with things. I am even slowly getting a couple of my besties on the healthier bandwagon. Now I don’t expect to convert them to a full fledge clean eating lifestyle. I am not even on a full fledge clean eating lifestyle. 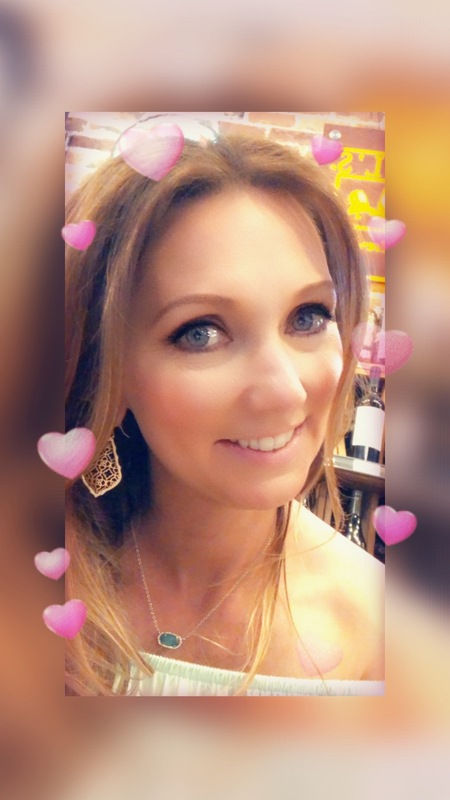 I love my desserts, treats, wine, etc. While I always try to keep them in check, I know me well enough to know that I will never fully give those items up! So I was thinking that today was a perfect day to let you all in on how happy I am to be slowly but surely getting back on track! 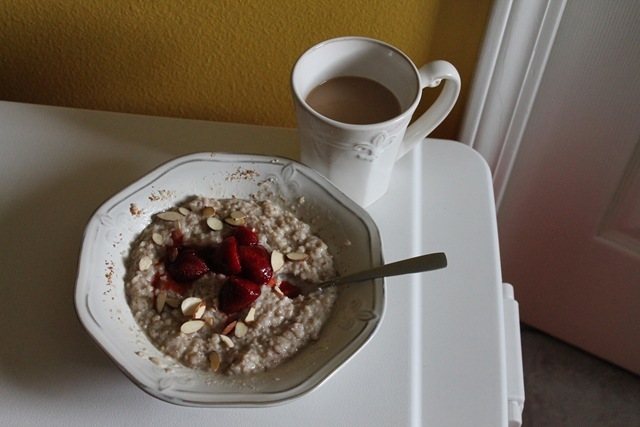 Breakfast: oats with coconut milk, strawberries, and almonds served with coffee. The strawberries are from the huge flat that was given to my by one of my besties that I work with. We of course had to put them in the freezer so as not to lose such wonderful fruit. 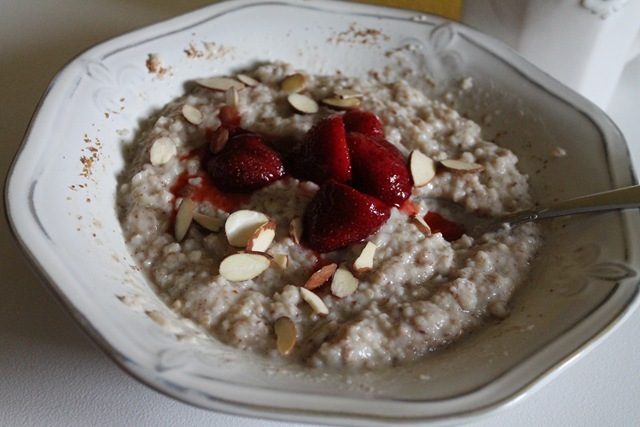 I thawed a small bag out the other day to have for breakfasts/snacks so they are sort of like macerated strawberries because they have the liquids which was delish in the oats! 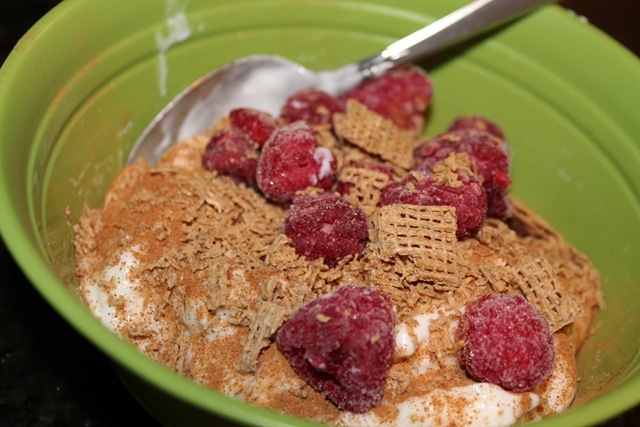 Snack: vanilla yogurt with frozen raspberries and crushed whole wheat chex cereal. Oh how I have missed my yogurt! I didn’t realize that my body was craving this wonderful snack until I finally ate a lovely bowl of it. I may or may not have eaten this multiple times already! 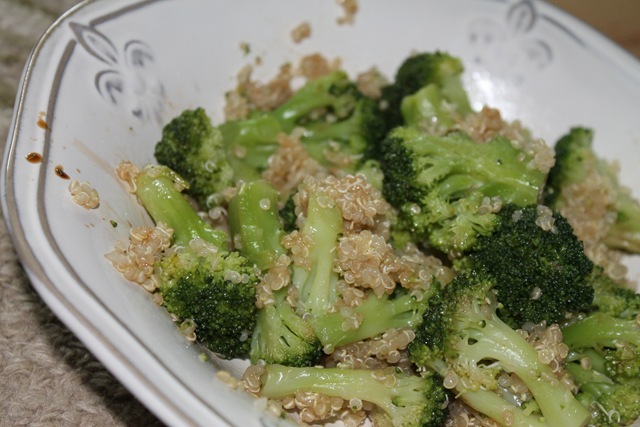 Lunch: quinoa with broccoli, seasoned with sesame oil and soy sauce. KeenWaaahhhhh! I cooked a full cup of dry quinoa the other day so I would have a lovely bowl available to eat on all week. I may or may not have eaten this multiple times in a day as well! I have made several stir fry dishes with this using various veggies, but one of my favorite bowls this week has been quinoa, corn cut off a cob, roasted squash seasoned with butter spray and garlic salt. For my killer sweet tooth I have been grabbing a few dark chocolate chips or a small spoon of biscoff spread with 2-3 wheat ritz crackers. I have also started back with some activity. A friend and I walked two miles on Monday, and I made it to the gym today for a 30 minute treadmill workout with 30 minutes of weight machines. Your running plan sounds great– good luck with it! And YUM, a whole flat of strawberries is the best present ever! I have never had a partner to work out with so I am really hoping this group run works out!! I just got back from Texas and though I stayed on track, since getting home I have just been sorta ho-huming it! I have been walking it but not pushing, eating ok, but not doing anything great and staying kinda stuck! So thank you Helen, I need to get my groove on and get back on track! I as well like my wine and sweets on occasion too! Though I am a sudo vegan, we have date night once a week where we eat what we wish! It works for us–I just need to be more focused the rest of the time!! Thanks for showing me the diet mojo, I needed it! Broccoli + soy suace = winning combo! add some quinoa and you’ve got a delicious lunch! 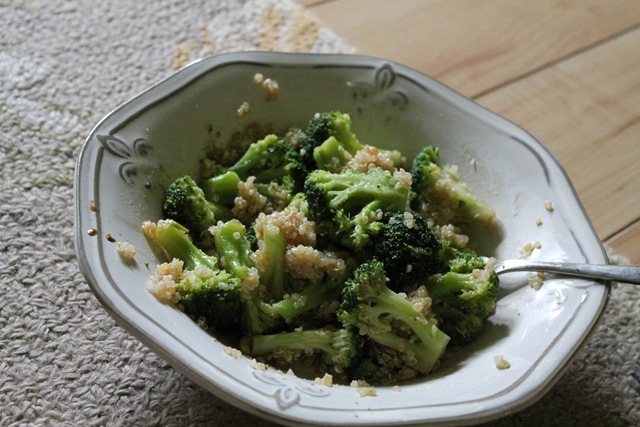 Yummm I love quinoa, AND I love broccoli! Sometimes I make a “stir fried rice” With quinoa, egg whites, broccoli and soy sauce!